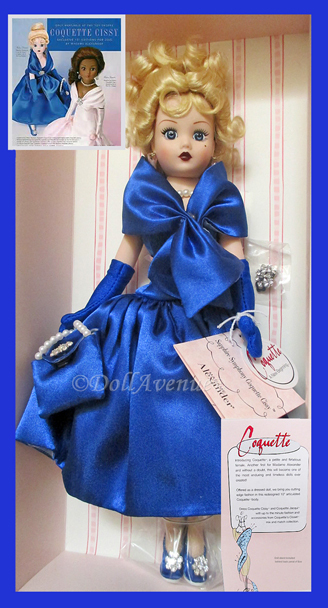 Madame Alexander "Sapphire Symphony" is a beautiful 10" Coquette Cissette doll from the 2005 collection and a Limited Edition of 500. She has blonde hair styled in an elaborate up-do and pretty blue eyes. Her dress is gorgeous and made of sapphire blue satin with a matching lined cape, gloves, and a rhinestone adorned purse and pumps. She wears a rhinestone clasp on her cape, which is still in its original bag, a pearl necklace and long dangle sapphire earrings, still in their wrappers. Sapphire Symphony is all vinyl with joints at the neck, arms, legs, and knees. Sapphire Symphony Coquette is in MINT condition, having never been displayed. She comes in her Coquette Cissy window-box with handtag and doll stand included behind back panel of box.